Well-listed Italian painter of beaches, peasants, and genre. French painter of portraits, genre and nudes, with strong auction records. Instructor at the Academie Julien in Paris. 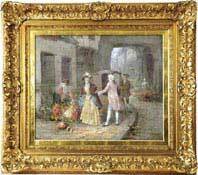 Well-listed painter of portraits, interiors, taverns, musicians, and genre. Charles Rowbotham exhibited widely during his lifetime, and he has hundreds of auction listings. His father and grandfather were also accomplished artists. 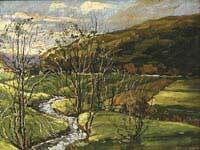 Rowbotham worked primarily in watercolor, and is best known for English and Italian settings. 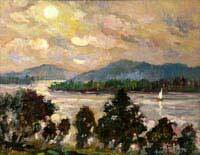 Listed French painter of landscapes, boats and fishermen. Born in Moscow in 1956, Tatyana Petrova is a well-trained artist with extensive exhibition listings. She trained at the Moscow Art Academy, with Dmitri Mochalsky, and participated in several plein-air workshops. She is a member of the Union of Artists of Russia and the International Art Fund. Her works can be found in The Ministry of Culture of Russian Federation, Union of the Artists of Russia, City of Ekaterinburg Museum of Fine Art, Museum of Modern Art in Moscow, and several private collections. Born in Argentina, Fini was self-taught and a successful portrait painter by age seventeen. She moved to Paris in 1933, where her work took on a Surrealist quality. In addition to painting, she designed sets and costumes for theater and opera houses. She has impressive auction records. John Gould was one of the great naturalists of the 19th century. His field studies resulted in folio volumes containing approximately 3,000 images of birds. 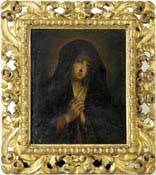 His wife Elizabeth was his first primary artist, succeeded after her death by H.C. Richter and others. Charadrius Veredus (Oriental Plover) is from Gould's Birds of Australia, one of his major works. Totanus Griseopygius (Grey Rumped Sandpiper) is from Gould's Birds of Australia. Elizabeth Gould was an accomplished artist by the time she married her husband, naturalist John Gould. 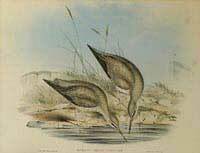 She was his primary ornithological artist and painted many birds while in Australia.